Pucara is a town located at about 3900 m.a.s.l., almost 2 hours from Puno and 6 hours from Cusco. 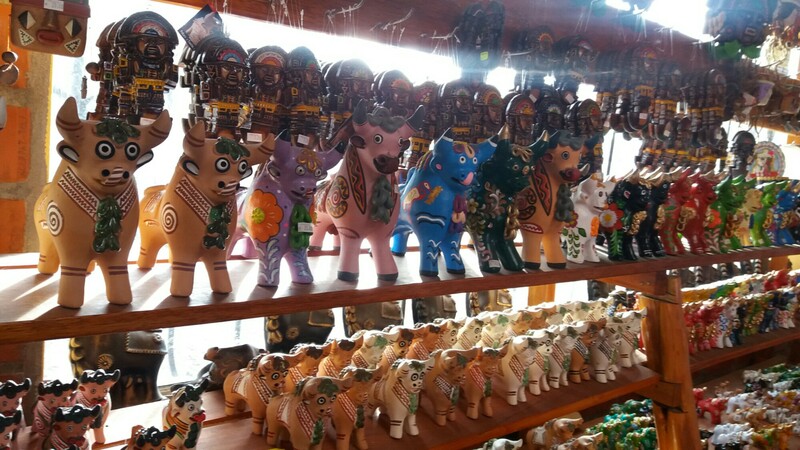 The local tradition is the production of ceramics that have the shape of “Toritos” or little bulls, and the artisans of this town make them in all different sizes and colors. These bulls are put on the rooftop of the local houses always in pairs as a calling for prosperity and fertility, they have been converted into small souvenirs that are painted in many colors symbolizing love, good luck, money and wealth, good health and other curious things. The archaeological evidence says that on prehispanic times the houses of our ancestors were decorated with powerful symbols or totems, representations of gods that took the shape of puma, condor or snake, also the gentle llamas and alpacas were represented, after the conquest these symbols were completely forbidden, but the recently introduced European bulls (animals that seen so strong that represent strength and fertility) end up replacing the local totems. Now the Toritos de Pucara are in the list of the most shopped articles on Inca Markets within the country, so don’t leave Peru without a pair of them! for abundance and prosperity …. just in case…!